I think most of the United States is under snow right now. Even if you are looking at green grass there is something so comforting about big bowls of nutritious soup. I created this round up of belly warming soups that you can easily make at home and enjoy after spending time out in the cold. 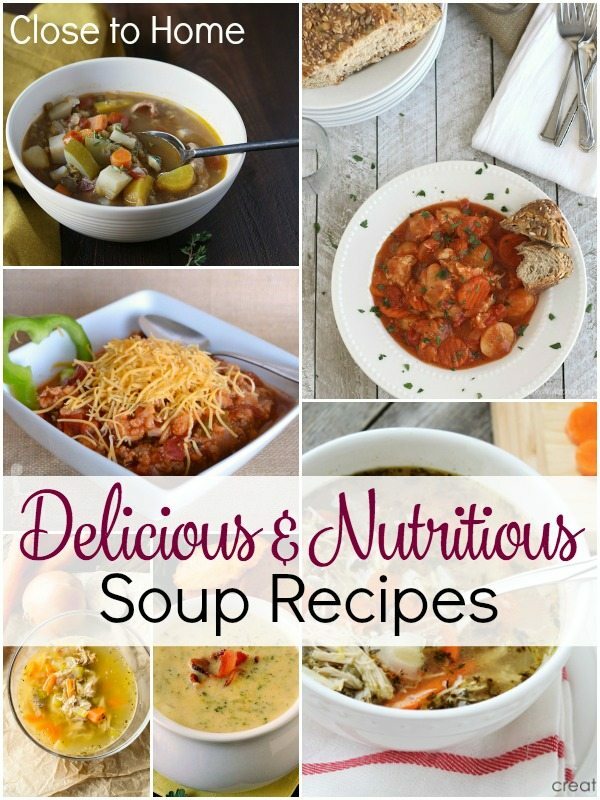 From Vegetarian soup recipes to hearty stew recipes we have you covered with a soup recipe that your whole family will enjoy. Vegetables are a light yet nutritious meal for any dinner! If you are looking for a vegetarian soup recipe you will find a few here. For colder nights, try a thick meaty broth or chili. A hearty meat soup recie can provide the perfect comfort for a chilled winter day all in a one bowl meal. For a medium-thickness when vegetables are too light but meat too heavy, try these healthy chicken alternatives! What is your favorite Comfort Soup recipe for cold winter days? Love this list! Thanks Maria! Delicious recipes, Maria! Love you made a version with/without meat, easier to choose. And thank you so much for including my zucchini soup!